For illustrated stamps, you really need not look any further than the Czech Republic. 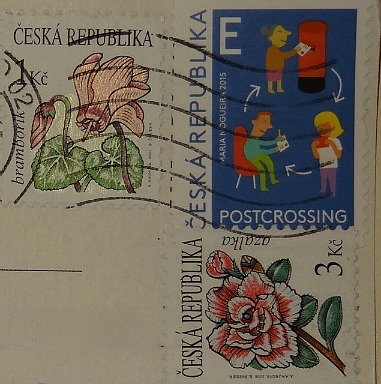 I'm not entirely certain, but it does seem like 99% of their stamps are illustrations rather than photographs. to this 2014 stamp promoting Good Luck, with a dog chewing on a four leaf clover. It was designed by Jiri Sliva and I really have no idea why the attached bit on the left is of a dog tied to a lamp while reading a book. But - and I did not know this - if you find a four leaf clover and you are wanting to find a mate (husband) an unmarried woman is supposed to eat it and the first unmarried man she sees afterwards will be her true love. 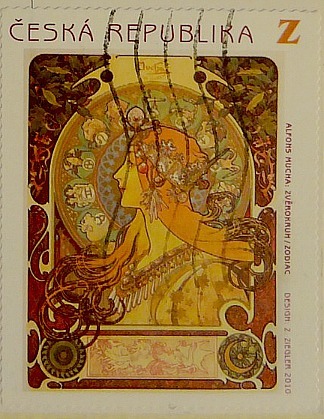 I am not a fan of Mucha, but this stamp is nice. The dog one is strange. I think that is one of my favorite Postcrossing stamps. It tells the whole story of how it works! 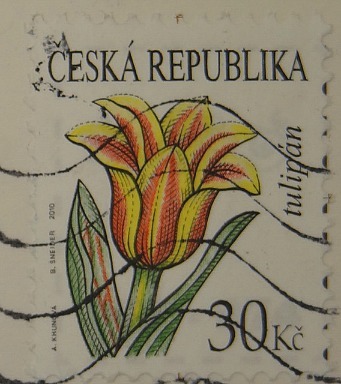 I agree, the stamps from Belarus, Netherlands and Finland aren't nearly as clear. I think I have most of the flowers - or at least I have a lot of them. A stamp promoting good luck sounds a bit strange to me. But the stamp with the dog is fascinating.